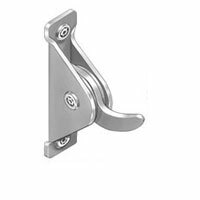 [XPB-SA37] Security Clothes Hook is fabricated with an 11 gauge stainless steel bracket with 7 gauge stainless steel hook. The hook is secured with a torx-head screw and rubber friction washers. If more than 20 lbs is forcced upon, it releases. Specifications and detail information available upon request. For shipping quotes, orders or questions please call our Customer Service Center at 1-877-483-9270.